Here is Day 3 if you are following along in our 7 Day Devotional on Joy from the retreat in Italy. So grab your coffee and journal and I hope it blesses you today. Do we trust God? We say we do, but do we REALLY? Do we truly believe that God knows more about what we need than we do? Well, thankfully joy is much different. Joy does not depend on what is “happening” in our lives. Joy is something that lives inside of us… something that stays deep down in our hearts. It doesn’t change with the days or with our circumstances. It is always there even through our hardest days. Joy is part of the fruit of the Holy Spirit, and we will talk more about that tomorrow. 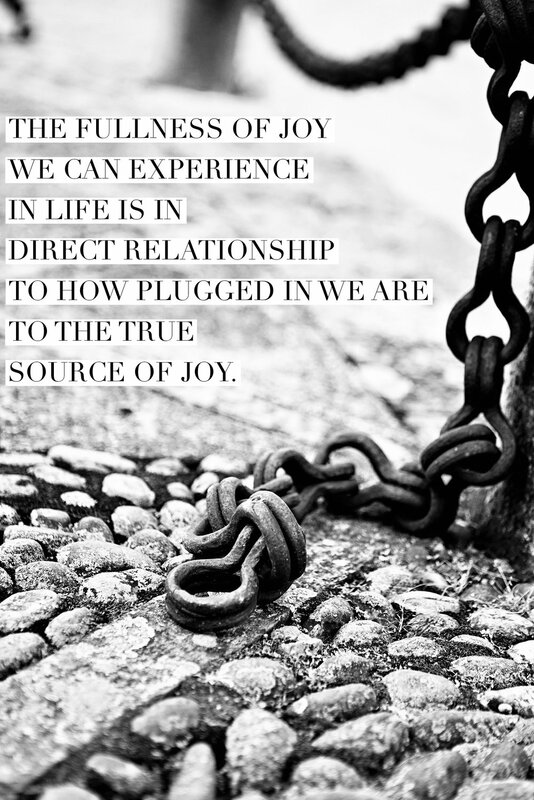 So how do we tap into this fullness of joy? Think of a lamp. If you were to put your hand out towards the lightbulb, you would feel the warmth, right? The closer you got to it, the warmer it would feel. The lamp is the SOURCE of warmth, just like our God is the source of our JOY. So why don’t we stay close to that warmth?? I don’t know about you, but I have filled up my days with so much “busy-ness” of LIFE… that I just didn’t make my spiritual life a priority. And THAT is a huge mistake. One morning as I was writing and putting this devotional together for the retreat, I woke up with the words on the photo above in my head. And it really went straight to the core of all of this… Christ is that SOURCE and how close do we stay to His life-giving joy? We need to understand our need for God, and we need to actively work on “plugging” in. This is the only way to strengthen our relationship with our Creator and have that fullness of joy David was talking about. Just like spending time with a close friend over long coffee talks builds that relationship, it’s through prayer, worship and studying God’s Word (and coffee is great here too …) that we can build our relationship with our Lord & Savior and tap into that true source of JOY! There are so many reasons to want a strong relationship with our Creator! 1. List some reasons in your journal why it’s important then to stay “plugged in” to His warmth. 2. Draw a lamp or lightbulb to remind you of staying close to that the source of LIGHT & JOY.